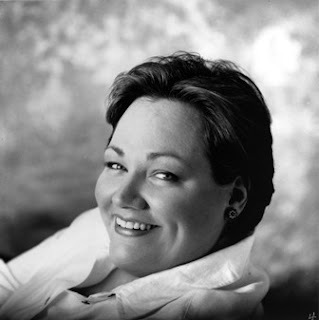 Today we have the opportunity to hear from Stephanie Blythe, world-renowned mezzo-soprano, who will play the roles of Fricka, the Second Norn, and the Gotterdammerung Waltraute. SG: For this production of The Ring you are reviving your roles as Fricka and the Second Norn, but you're taking on a new role as well, with Waltraute in Gotterdammerung. Which of these are you most looking forward to this summer? What do you like about each of these parts? 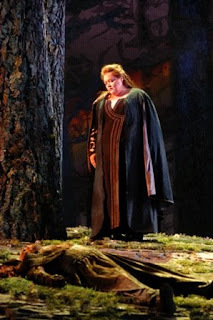 SB: I will always hold Fricka close to my heart as she was the first role I assumed in the Ring Cycle. Coming back to her feels like visiting an old friend. Being a Norn is also a total joy, as she is part of a beautiful ensemble. It is especially wonderful this summer as the original Norns from 2001 have been reunited - Lyretta Bybee, Margaret Jan Wray and I have so enjoyed putting this scene back together, as well as discovering new nuances in the relationships with each other and the music and text. It is a gorgeous scene of which we are all quite proud. As for adding Waltraute to the mix, well, that is a special challenge and a treat for me. The scene with Brunnhildes is so glorious - two sisters meeting again after a long, painful separation, discovering themselves totally at odds and struggling with opposition and the love that still exists between them. The music is incredibly difficult and totally satisfying. I must add that having an opportunity to share the stage with such a committed singer and actress as Janice Baird is a thrill. The scene work that we have done with Stephen Wadsworth was a painstaking and slow development, and the result is a scene that we love to play. One of the most interesting things about playing several roles in a work like The Ring, is that you get a unique perspective on each character - for instance, knowing the story from the viewpoint of Fricka cannot help but influence my thoughts as Waltraute, but I have to be sure not to get to much of each girl into the mix - it's a really fun challenge. Going from one girl to the next on some days is really interesting, but hey, some of my colleagues, Wotan for example, can rehearse two or even three different operas in one day of rehearsal - that is amazingly difficult. SG: This particular production is unique in that Fricka is sympathetic and we can relate to her character more so than in most productions. How have you and Stephen gone about creating a real three-dimensional character for the part of Fricka, who can often come off as the shrewish wife? SB: I get very prickly whenever Fricka gets called things like a shrew. Let's look at the whole situation from Fricka's point of view. Your husband promises to build you a glorious home which makes you extraordinarily happy, because perhaps that will mean that he stays home more often, and spends a little less time straying. Great. But he decides with the help of his friend Loge, that he should pay for said house by giving your sister to the contractors. He says he never meant to honor the deal, so that should make it all ok. Then he proceeds to make one horrifying choice after another, and you, as the woman who loves him, has to stand there and watch, all the time knowing that the consequences of these choices with bring about the end of their very existence. So, by the time Walkure comes along, Fricka cannot stand and watch anymore. 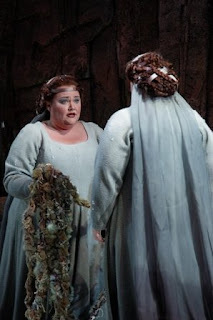 Her arguments are totally justifiable, and we as the audience see that because even Wotan sees it. Is it painful and horrible to see this couple having an argument on this scale? Absolutely - but Fricka is no shrew, because she make s her demands of her husband all the while knowing that this will end their relationship, and she is willing to sacrifice her love for the sake of what she knows is right. Stephen and Greer and I have created this sympathy because we all believe that these two gods love one another. When we see them at first in Rheingold, they are constantly touching, Wotan always reassuring Fricka. They look to one another for answers and strength. The situation is horrid, to be sure, but Fricka does have faith in him, and it is wonderful to see and hear Greer as this young, impetuous, free god. The way we play together onstage is so endearing and full of joy, as well as trepidation. That way, when we get to Walkure, the pain of their argument is made all the more terrible, and her final demand of him followed by his oath to fulfill her wishes is agony for both of them. I cannot tell you how may times audiences members have come to us and thank us for showing a real couple - all the love and the difficulty too. That contrast is the key - just as you cannot understand white unless you know black, so you cannot know the pain of loss if you never saw the love in the first place. SG: Have you seen an evolution of Fricka from the summer of 2000 when the first two operas in the Cycle premiered? SB: I think she has evolved because I have evolved. I am not the same woman that I was back then. I have essayed new roles and grown as a singer and a performer with each new experience. I am also nearly ten years older now, and I can tell you that those years have brought a new perspective on this character. SG: When preparing for Wagner and The Ring do you do anything special for the roles? SB: I prepare in a similar fashion for all my roles. I study the text, learn the notes, take the part to a coach who really understands the style - The Ring is a bit of a special case, as it is so long, and though my roles are not the longest in the Cycle, there is a stamina that has to be learned as well. SG: Later this season you will be taking on the role of Dame Quickly in Falstaff and you played the title character in Italiana several years ago. Can you talk a bit about the difference in playing comic characters like these compared to the uber-serious roles in Wagner? Do you enjoy one over the other? SB: I can honestly say that I enjoy all the characters I play equally. Comic roles and serious roles are both difficult to play, but the difference between them is the way you react to information. As many great actors and directors have said - Acting is all about reacting. I could make Quickly deadly serious if every reaction was delivered in a expressionless, straight-faced fashion. Likewise, I could make Fricka hilarious if I turned a few glances into double takes, etc. It's all in the vocabulary of reactions. SG: Some of the roles in this production are being performed by the same people as before and some are new to this production. Does this alter the rehearsal process for you? How do you establish relationships on-stage with these new singers? How do you re-establish relationships with the people you have worked with in the past? SB: The only way that new performers alter the process is that we need to take a little more time to establish the scenes because that work hasn't been done before. We took five rehearsals to shape the Brunnhilde/Waltraute scene because I was new to the role and Janice was new to the production. By contrast, Greer and I only took two rehearsals to re-establish our scene in Walkure. It just came back to us rather quickly, and then was able to grow even stronger because we have both brought new things to the table. One of the great joys of doing this work in Seattle is that we get so much rehearsal time. Yes, it is difficult to have to dedicate three and a half months to one (very sizable) project, but rehearsal is the only way to establish relationships with our new colleagues. With some of my friends here, coming back to The Ring feels like we are just picking up where we left off - that is always a joy. I can honestly say that I believe that we have an incredibly strong cast this year, in every possible way. What may have become old hat for some of us who are returning has been revitalized by new blood, and the process of putting this particular Ring together is made all the more wonderful because it isn't easy, it's bloody hard work. When this show opens on August 9th, we will all have the satisfaction of knowing that the hard work has truly paid off - nothing this wonderful comes easily. Another great and revealing interview in this series. I think (and propose) these interviews re the "Ring" should be reprinted (in print form!) and sold at cost to "Ring"-goers and other interested people, as they will add GREATLY to the interest and understanding of those attending!!! Also, I'm afraid, from the derth of comments on this excellent blogsite, that all too few (maybe only one!!) person reads it!! PUBLICIZE it!!!! Mention it on KING-FM and in Seattle Opera magazine; encourage people to seek it out in the internet!!! If Jon Dean had not stopped me at the Film Fest and mentioned this blogsite, I'd NEVER have known about it, despite being a Seattle Opera devotee, whose third address is "Speight Jenkins Standing Room, Mc Caw Hall"!!! Thanks, loads, Jon!!!!!!!!!!!!!!!!!! !